For the Final Exam, you will be tasked to created an app from scratch. The final is due one week from the date Certification Training is completed. If you would like an extension or have any questions, please notify your Certification Trainer. Click here to download the final exam resources you will need. Open the “Final Exam Online Certification” file for instructions. When your app is complete, complete the form on the left. 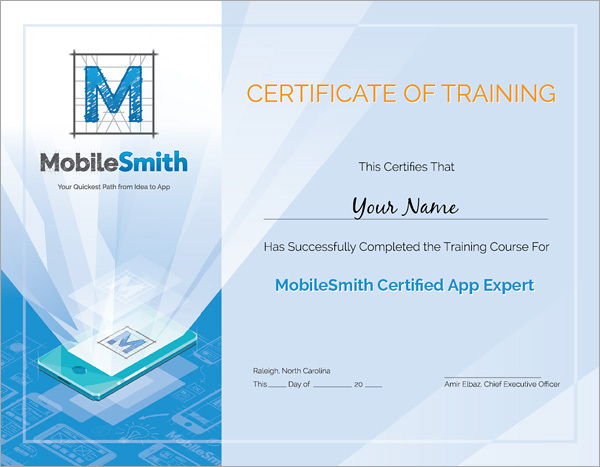 We hope you are excited to begin building apps with us, and want to welcome you to the MobileSmith community!